OMG I love crepes. Filled with fruit, filled with jam, filled with anything. 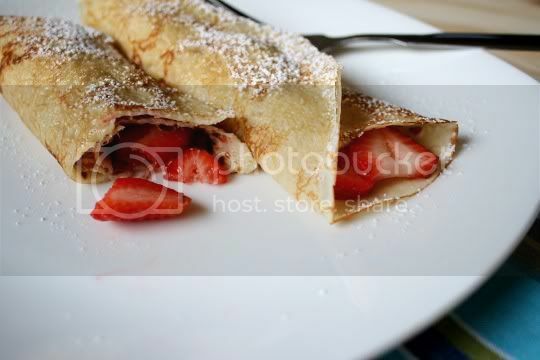 But perhaps the true sign of a good crepe is one that can be eaten alone: no fillings, no toppings, just a plain crepe...and this recipe is a sure winner for that. Don't be frightened by people telling you crepes are difficult to make. They really aren't; if you can make pancakes, you can make crepes. 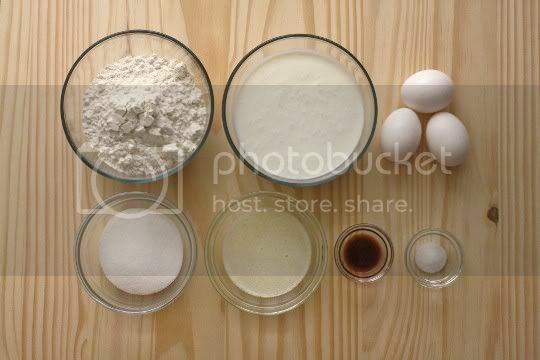 For this recipe, simply whirl in a blender flour, buttermilk, eggs, sugar, butter, vanilla, and salt. Let this mixture sit for an hour to thicken slightly, and then you're ready to cook. Now the tricky part of crepes (like pancakes) is getting the pan temperature just right. As a result, the first one will ALWAYS be a dud. That's just the rule, it's guaranteed, so don't be discouraged. But this first one will let you know if the pan is too hot, too cool, not coated enough, etc. Now onto your second one. Add about 1/4 cup of batter to the pan, and immediately start swirling it around the pan. The batter will set quickly, so this is important for a nice even thinness. It's ready to flip when the edges start looking dry, with just a hint of browning, and air bubbles start to form in the center. Watch these babies like a hawk (they can burn easily), but you'll probably only need about two minutes per side. As they're cooked, start stacking them (and try not to eat them all at once!). These crepes have a perfect flavor, texture, and consistency. The buttermilk in the batter gives them a bit of tanginess, and the sugar amount is spot on. 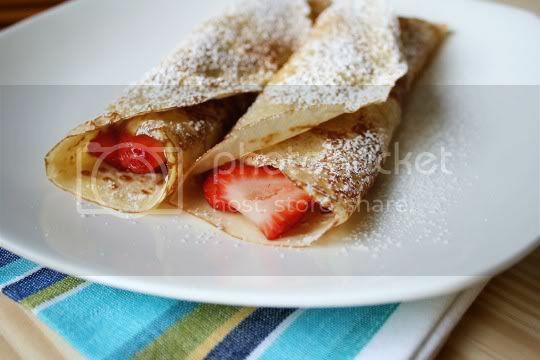 The crepes have a thin, delicate, but chewy texture with crisp edges, and are just strong enough to hold chunky fillings. Fill with chopped fruit, jam, or even some veggie meat slices and cheese for a more savory meal. Or, eat them plain! Trust me, they're that good. Make again? Definitely. I'm glad I've found an easy go-to recipe for this delicious treat. Vegan variation: Use a buttermilk substitute, egg replacer, and vegan butter. What are the measurements?! I'd love to make these this morning.